BC Hydro and the Syilx/Okanagan Nation developed an Enduring Relationship Agreement for the management of issues relating to BC Hydro’s operations and assets across the Syilx/Okanagan Territory. Under the Agreement, Okanagan Nation Alliance and BC Hydro identified the development of strategic contracting and training opportunities that result in economic and social benefits flowing back to the Syilx/Okanagan Nation as a key area of focus. 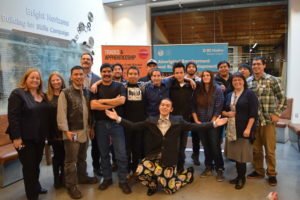 To accomplish this, the Okanagan Nation Alliance and BC Hydro are working together to develop a regional and Nation-specific employment, education and training strategy and course opportunities that align with BC Hydro’s long-term labor and procurement opportunities linked to their capital projects and maintenance programs. 15 Syilx/Okanagan Nation members were funded to receive NRTG/NVIT Environmental Technician Certification Program. 7 Syilx/Okanagan Nation members were funded to participate in the Construction Craft Worker Trades Program (Red Seal trade), from Sept 12 – Dec 16, 2016. 15 Syilx/Okanagan Nation members were funded to receive a certification in NRTG Biogeoclimatic Ecosystem Classification & Terrestrial Ecosystem Mapping Training, June 1 -2, 2017. Syilx/Okanagan Nation members received training in First Aid, UTV and ATV training through various BC Hydro projects. A Nation member has been hired as the Construction Manager Trainee position within the West Kelowna Project. 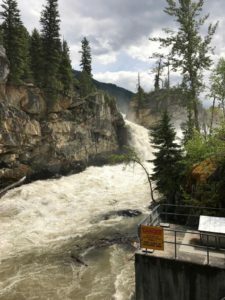 The Revelstoke Generating Station Unit 6 Project (REV6) is actively engaged in the Provincial Environmental Assessment (EA)process to upgrade the current Revelstoke Dam with a sixth turbine. The Arrow Lakes and the Columbia River is significant to the Syilx/Okanagan people and their Title and Rights. A Project Review Committee (PRC) was established is being led by the Okanagan Indian Band in collaboration with the Westbank First Nation, Penticton Indian Band, and the Okanagan Nation Alliance to work with BC Hydro in a new collaborative approach. Through the PRC the Okanagan Nation drafted and submitted a Part C in the EA process to reflect Syilx/Okanagan Title, Rights and Interests in the project, as well as identify the significance of potential impacts of the proposed project and past cumulative effects. The working relationship between the PRC and BC Hydro will be a model for collaboration on future projects and will help build and strengthen the Enduring Relationship in the territory. The PRC is currently working with BC Hydro and Environmental Assessment Office to complete the environmental assessment and to develop mitigation measures that should be undertaken to reduce the REV6 impacts on Syilx/Okanagan Nation members, with special emphasis on the cumulative effects of BC Hydro activities over time in the territory. BC Hydro has two water licenses on the Shuswap River that require renewal by December 31, 2018 under the Water Sustainability Act (WSA). This is the first water license renewal for BC Hydro in forty years and the Syilx/Okanagan Nation look forward to working on this process in a collaborative manner. 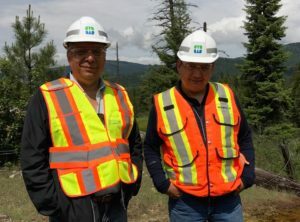 A Project Review Committee (PRC) was established is being led by the Okanagan Indian Band with the support of the Okanagan Nation Alliance to work with BC Hydro in a new regulatory requirement. Under the WSA the Comptroller of Water Rights will assess the application on the residual effects of the renewal based on the full capacity of the operation and the continuation of the operation. Currently, BC Hydro is proposing no change to the water rights or the operations of the Wilsey dam under the existing license. The Syilx/Okanagan Nation has identified fish passage at Wilsey Dam as a high priority to be considered in this process. The location of Wilsey Dam has huge cultural and fishing significance to the Syilx/Okanagan people and our Title and Rights. On February 5, 2015, the Province of British Columbia and BC Hydro announced the West Kelowna Transmission Project. BC Hydro is in the early planning stage for a new, secondary transmission line delivering clean, reliable power to the communities of West Kelowna and Peachland. The new line will strengthen and reinforce the existing transmission network. About 22,000 customers are served by the Westbank Substation and a single 138 kilovolt transmission line. The existing transmission line is 80 kilometers long and runs through rugged, remote terrain susceptible to forest fires and landslides. A Project Review Committee (PRC) was established is being led by Westbank First Nation in collaboration with Upper Nicola Band, Okanagan Indian Band, and the Okanagan Nation Alliance. The PRC and BC Hydro studied three alternatives for a new, secondary transmission line. In the fall of 2016, BC Hydro, with agreement from the Nation, identified Alternative 2: Westbank Substation to Nicola Substation as the leading alternative. This alternative involves building a new transmission line from Nicola Substation to Westbank Substation using a different route than the existing transmission line. During the next stage of the project BC Hydro, with support from the PRC, will undertake detailed environmental, socio-economic, archaeological, traditional use and engineering studies for Alternative 2 as the leading alternative.